Over the course of two weeks, ASCE OC YMF/OC Branch – K-12 Outreach made two classroom visits to Yorba Middle School. On Thursday, February 21st, they visited the group of middle school students that are involved in a lunch club at Yorba Middle School. The teacher who brought the club to life is interested in bringing professionals on a monthly basis to talk about their field of work and share any other insights that could benefit these students at their young age. Present volunteers were Jared Lindo, Guillermo Medina, and Nestor Godinez. The outline for this first visit was for them to present on the different fields of civil engineering and how each of them got to where they are regarding their initial interest in engineering and the educational path they went through, and finally concluding with what they currently do at their jobs. Students were engaging throughout the presentation and were particularly interested in structural and geotechnical engineering and the type of impact those fields have on our daily lives. The presentation concluded with allowing them to vote on the hands-on STEM activity they would like to do the following week since they knew we were returning. On Thursday, February 28th the K-12 Outreach volunteers returned for the second visit, this time the only item on the agenda was a water filtration activity. After the presentation, the students learned more about the importance of clean water and this event ended up receiving the most votes. The goal of the activity was to educate students on the process water goes through to be cleaned. 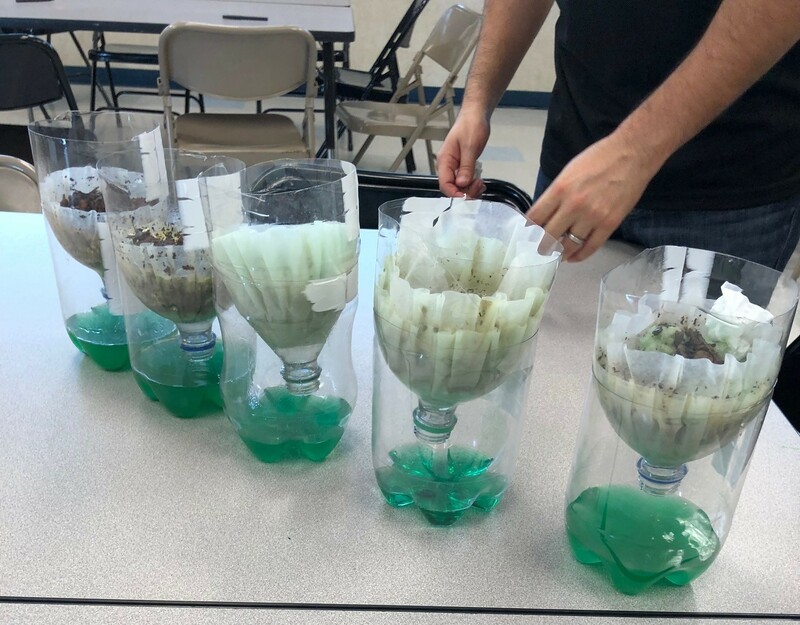 This week Guillermo Medina and Nestor Godinez attended and worked with the students first to demonstrate how water ends up getting polluted and second to help them create their own filters. Tap water was mixed in with several “contaminates” that represented real-world situations. Dirt (representing debris and soils), vegetable oil (representing motor oil), baking soda (representing salt), food coloring (representing chemical spills). Groups of students worked together to find the best combination of cleaning materials to create the best filtration device. The team with the cleanest water walked away with some cool ASCE pens/highlighters.